Its imperative you plan, plan and plan again for the most perfect day and with over 10,000 weddings experience, we've seen all the pit falls and want you to have the happiest and most successful day......after all you cant do it again if you don't get it right! The 'Wedding Reception Planning Guide' will give you an idea and help you to think about the procedure and formalities at your Reception. I hope this helps and gives you an overview as to how your Reception will come together and please feel free to change to suit your plans. Middleton Events has provided the following information as a “Suggested Wedding Reception Planning Guide”…every reception is different and it’s your wedding! Any event may be added or removed. Don’t forget to add any slide show timings, along with videos, performances or anything else not listed. It’s vital that your MC/DJ works in conjunction with your Banquets Manager on the night of your reception for seamless service. We will have a briefing prior to commencement to clarify timings and formalities. You should ensure your 'Timeline Form' is completed thoroughly and emailed to all parties involved in your wedding, so that everyone is on the same page and that the food, service and entertainment runs smoothly without delays or stress. Don't forget to make comments on your timeline and also put contact numbers alongside the tasks, in the event calls need to be made on your behalf. Your 'Other Professionals Form' also needs to be completed, so we know who else you've engaged for your wedding. Its not uncommon for Middleton Events staff to be calling suppliers to check and double check timings, deliveries and details. 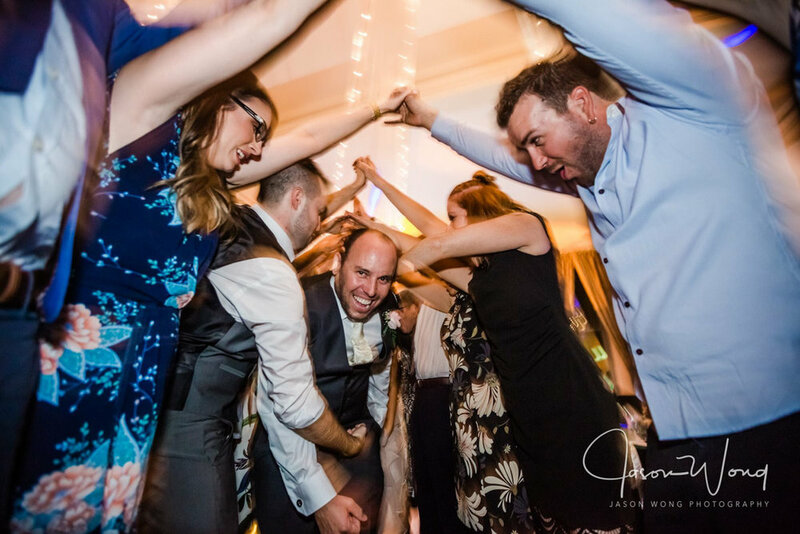 Your Middleton Events DJ/MC will be tasked with ensuring we liaise with everybody involved in your wedding to ensure the best outcome and experience for you. We will work tirelessly to ensure everything is exactly how you want it! This format is considered to be the most common and effective after over 10,000 weddings experience. Once the guests are up dancing, it's important to keep them on the dance floor whilst keeping the momentum and atmosphere at a peak. Below is a 'typical' Wedding Reception format, however this can be changed to suit your needs. PHOTO BOOTH - it's advisable to have the booth booked 30 minutes after the guest enter and 30 mins before leave time as it's no ideal to have guests in the booth and the booth open while formalities are taking place. this will save you an hour of operation. MC/DJ will announce and invites guests to be seated once the venue has given us the all clear. MC/DJ will introduce themselves to the Bridal party and have a brief chat as to what to do and what's going to happen. They will then return to the mic and get guests attention for the introductions, entrances with song cues of your choice. MC/DJ introduces self and makes general housekeeping announcements, welcomes guests on your behalf and advises guests of dinner and speech arrangements. MC/DJ to announce Cake Cutting and will invite guests to take photographs after your official photographer has captured your photo. Once the photographer is happy with their photo, MC/DJ will invite all family and friends to the cake to capture the moment. This is a good idea at this time for 2 reasons. Firstly the photographer is still present and can capture the cake cutting ceremony and secondly, the cake is generally dessert and can be cleared to the kitchen in preparation for dessert. This can take place after Main Course as an option if not being used for dessert or is a display cake. You can separate speeches and commence after entree and then complete after mains is cleared. This works well if you have a lot of speeches to break them up. If you only have a few, then it's best to do after mains, to give kitchen time to prep dessert and a short break after the main meal. You will need to confirm this with your event coordinator to allow them sufficient time for food service. (Optional speeches here) preferably only 2 speeches (the parents) so food service is not interuppted. MC/DJ to liaise with Banquets Manager before commencing speeches to ensure the Bridal table has been cleared and reset. MC/DJ will notify Bridal Party and speakers in readiness, so they can get jackets on and be looking their best. Speeches to commence as per speech formality and procedures form. MC/DJ will announce that dessert will take place next and in approximately 15-20 minutes the Bridal Waltz will take place. Bridal Waltz usually takes part after speeches and dessert served to guests whilst party is underway. Your MC/DJ will announce when dessert is served. MC/DJ will liaise with Banquets Manager to ensure they are ready to serve. Its from our experience, we find the evening flows better if this takes place before the Bridal Waltz, as the Bridal Waltz is the start of the dancing and the partying and its difficult to dim lights, start dancing, stop for dessert, and then try and restart the dancing again. Generally the mood and atmosphere is lost if this happens and it's hard work to get them back on the dance floor. However to get around this, if we are behind schedule for some reason, your DJ/MC can announce that the Bridal Waltz will soon take place and say that tea, coffee and dessert will be served and made available while dancing and to help themselves. Not ideal if ice cream is being served with your cake. If dessert is not served until after the Bridal Waltz, then your DJ/MC will announce dessert service 4 songs after your bridal waltz selections and play some classic slow Waltz's will be played for the more 'mature guests' to enjoy and normally 4 songs are played here and then party the night away to the time of the 'Bouquet and Garter' toss. Not ideal, but still works well! Time to dim the house lights, get the Effects Lights, Dry Ice and Canons ready. This dance can be just on your own, or with the Bridal Party and Parents, who can join you part way through the Bridal Waltz. This normally happens about 1 minute and 30 seconds into the Bridal Waltz. The 2nd song is normally where we invite all friends and relatives to join the newlyweds on the dance floor. Alternatively the 2nd song can be a dedication to the Brides Father from the bride, so they can dance together and they dance that song while joined by family and friends. The 3rd song can then be a dedication to the Grooms Mother from the Groom. Your DJ/MC will announce your first dance together as Newlyweds! Your DJ/MC will start the party once all formal songs are completed. This song will be at the discretion of the DJ/MC to fill the dance floor, however we will endeavour to maximise your music selections and must plays. Your MC/DJ will announce and liaise with Newlyweds. Your MC/DJ will keep the dance floor pumping until your ready to leave. At that point they will get you ready and organised to leave before announcing the last dance. Your MC/DJ will announce the last dance together with the Newlyweds and invite all friends and relatives on the dance floor. At the conclusion of this, the MC/DJ will coordinate the departure of the Newlyweds and play your song choice. This will be done approximately 15 minutes before conclusion of the reception (Optional). The time the room has been booked to and the completion of entertainment and service. All guests must be out of the venue at the time you've booked the venue till, otherwise you'll incur overtime charges. This guide is exactly that... a guide. We're happy to add, delete or change the schedule for you, to suit our plans. It's your wedding and we want you to be happy. We're happy to discuss this further at our final meeting and if you're in doubt about anything, we can discuss in greater detail at that meeting. We wish you well during the planning stages, and we share your excitement, as it's a fun and exciting time. Please don't hesitate to call our events team anytime, as our advisory service is free to you, so feel free to ask any questions, or you can seek further advice via an email in your planning portal, or call us during office hours on 0400 416 991. Happy Planning and we hope you're enjoying our online planning tools and we can't wait to celebrate with you!